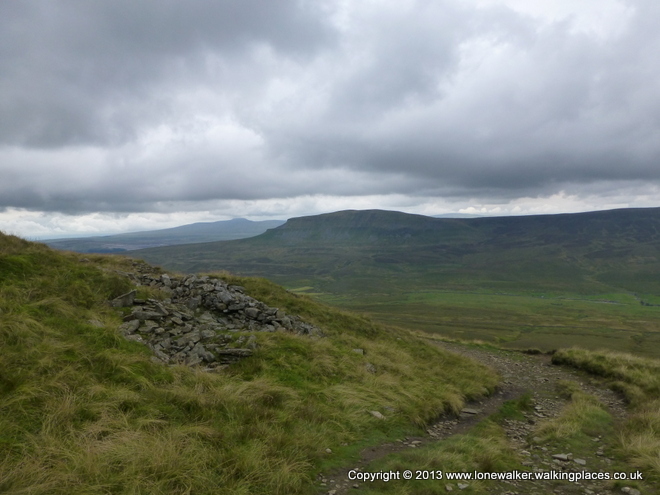 I’ve now done 30 miles of the Pennine Way as part of the Trailblazer guide book update. That’s about 10% of the total mileage that I need to cover during the re-walk. The official route length is about 256 miles, but with options such as the Bowes Loop and the Maize Beck Alternative I reckon there’s about 300 miles I need to walk in total. 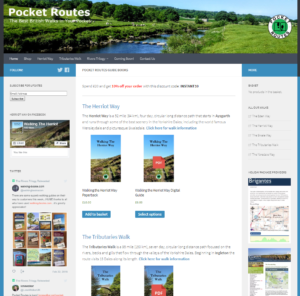 I chose one of my favourite sections, one of the easiest places for me to get to and one of my familiar stomping grounds to begin this re-walk – the section of the Way between Gargrave and Ribblehead in the Yorkshire Dales. Part of my thinking was that if I got the map update process badly wrong I could easily go back and do this section again. 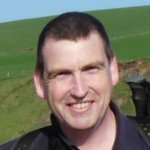 As I mentioned in my previous post I had been concerned about how to make notes on the maps when the weather turned bad – writing onto paper maps is not really viable when the rain is lashing down and the wind is trying to turn you upside down. In the end the weather decided it was going to do all it could to make the process as difficult as possible; it rained on Friday evening as I was leaving Gargrave and it rained for most of Saturday morning on the way to Malham and again in the evening. My process was well tested therefore. I decided to use my phone for the whole process. I use my Samsung Galaxy Note 2 for navigation, so it’s always in my pocket and close to hand and it’s lovely and functional, acting as a camera when it’s too wet for my compact digital and a multimedia device for the evenings playing music and video. Trailblazer have sent me an electronic version of the book so I loaded that onto the handset and followed the route closely with the maps on the screen. I then used the in-built voice recorder on the phone to make notes as I walked. Each voice note mentions the map number and then details the change that needs to be made. This is actually much better than written notes that would inevitably be hurried, possibly scribbled and simply not as detailed. Then, when I get home, I transcribe the voice notes onto paper maps with red ink so the cartographer can make the necessary changes. I parked at Ribblehead station on Friday evening and caught the train to Gargrave, where I did a quick village survey (checking the businesses and services shown on the map are still there) and was disappointed to find the chip shop missing! So instead I had a meal in one of the pubs and then set out along the path to find a suitably secluded camp for the night. The weather had looked threatening all afternoon and after only a mile or so beyond the edge of the village it began to rain heavily. 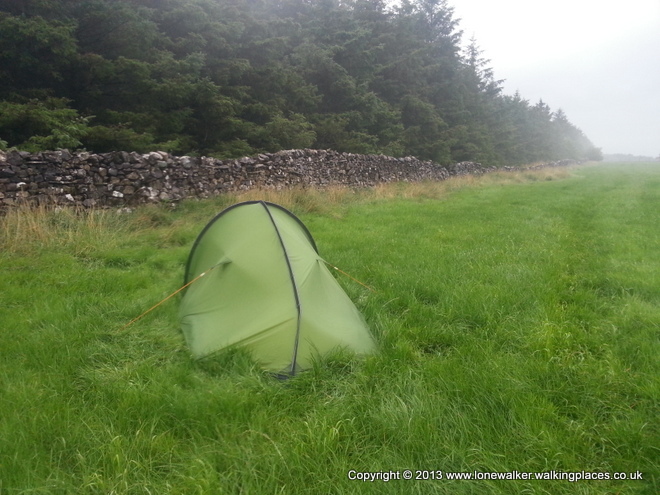 I stopped in the first field without livestock, close to a wall and right beside the path and put the tent up as quickly as I could. I still got soaked in the process. 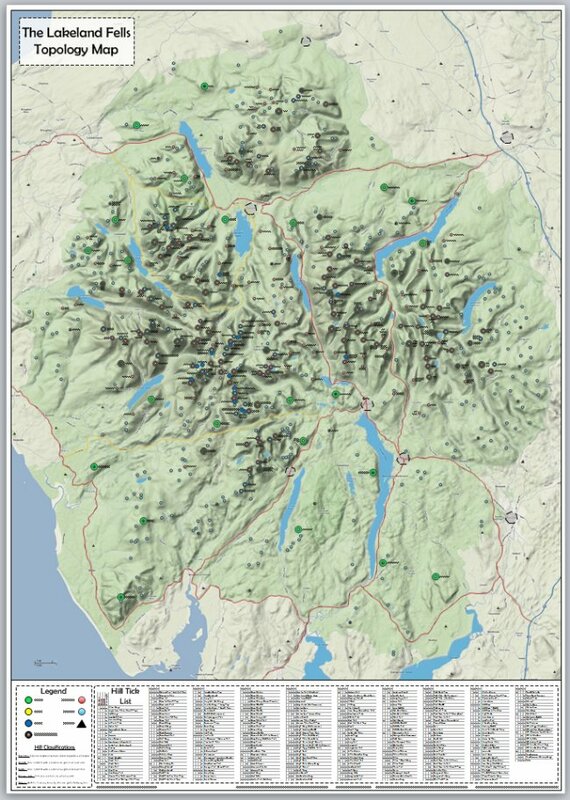 I squared myself away, with rain drumming on the tent, rang home and then spent a couple of hours listening to music and reading the book in advance of tomorrow’s walk. I got more sleep than I expected, thanks mostly to the earplugs I used and the rain was still falling in the morning, as I packed away my gear as best I could, completing as much inside the tent as possible. 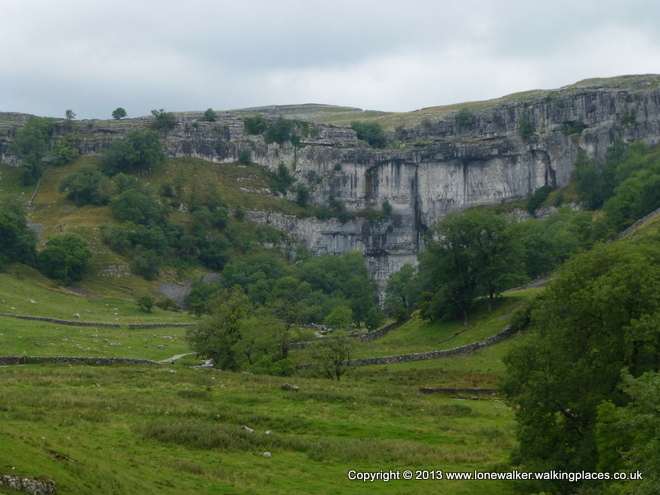 I had planned to breakfast in Malham, but I was now about 3 miles further from that village than I expected to be, so I got a wriggle on and walked through the rain for the next couple of hours. I arrived in the café in Malham completely drenched and I sat puddling in one corner as I ate my full English and warmed up with a huge pot of tea. An hour or so later, when I left, the rain had stopped and it actually held off for the next few hours. I climbed Malham Cove, passed Malham Tarn and took a long tea break in the large wooden shed-like structure that serves as a bird hide beside the Tarn, much to the silent, but obvious, annoyance of a lone twitcher. Beyond Tennant Gill Farm I plodded slowly up the long, gradual ascent of Fountains Fell where I had another short break in one of the sink holes beside the path. I had plenty of time and was reluctant to push too hard. 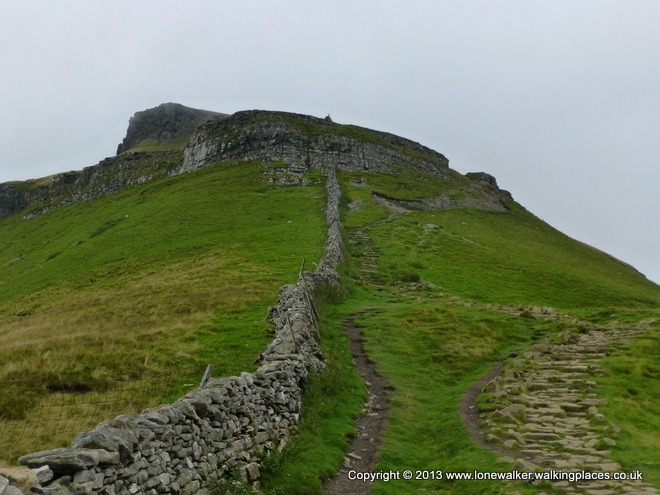 I had thought about camping on Pen-y-Ghent, just off the summit, beside a wall corner, but it looked like I’d be too early for that, so I was now aiming for Hull Pot, about another mile or so further on and lower down, which would help get out of the increasing wind. could pitch it, especially as I was so close to the Three Peaks route and there would be people walking by for a while yet. In the end I cracked, abandoned the idea of the Hull Pot pitch and headed for the train station in Horton. I could easily make the 19:06 train back to Ribblehead and be in the shower at home for 21:00 – which I was. The final couple of miles into Horton were hard work and in the end I walked 22 miles that day with several substantial climbs thrown in for good measure. I returned the following Saturday to walk the Horton to Cam End section and the weather was lovely (at least for the first part of the morning). 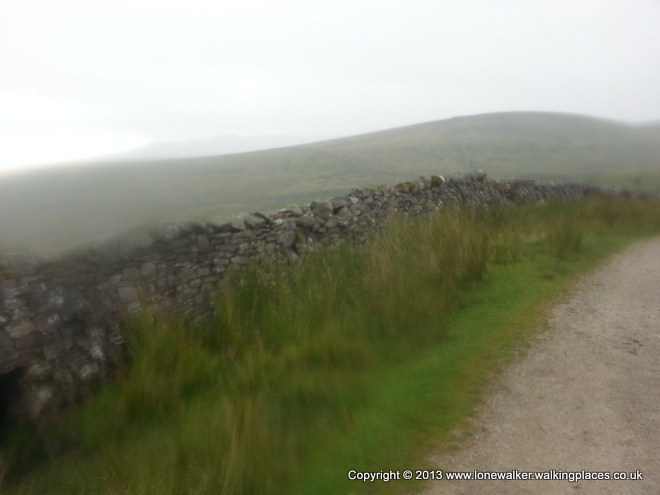 I now need to resume from Ribblehead sometime in the future and walk back to Cam End and then along the path to Hawes and beyond.